If you keep a tab on the trends in mens wedding ring, tanzanite would show up as one of the fastest movers. Extravagant, tanzanite gold wedding rings with or without diamonds and even tanzanite rings with opal inlays are in high demand. In this report we are going to educate you regarding, various features and factors that need to be checked and evaluated before you buy a mens wedding ring with tanzanite. What we will not be doing is making a sales pitch for our tanzanite mens rings. We will leave the buying decision to you, equipped with information from this report you are very likely to make the right decision - no matter where you buy your ring from. While diamonds, sapphires and rubies have been known for thousands of years, tanzanite has been around for just around 4 to 5 decades. The initial burst of popularity came when Tiffany's invested millions of dollars in promoting the gemstone. While tanzanite prices have not always been on the upward march, the gemstone has never ever become 'cheap' in terms of price point. Gem quality tanzanite is expensive, it will always be expensive and our report will explain why. The gem that you see in your mens tanzanite wedding ring would have a stunning blue-violet color, generally violet is more dominant with blue just peeping in. It is interesting to note that, rough tanzanite when it is mined has a dark murky greenish-brown color. Basically the rough gem is nowhere as gorgeous as the final cut and polished gem. Gem manufacturers, clean and cleave the rough stone and then heat it in specially designed ovens. The heat reacts with the elements inside the rough tanzanite and causes them to vaporize. It is only then, that the gem releases it's blue-violet color. The image below will give you an idea of what rough tanzanite looks like, the stone on the right in the same image has been heat treated. The lustre and transparency of the heated tanzanite will be seen once the gemstone is cut and polished. A sturdy men's tanzanite gold or 925 silver wedding ring for men. A choice of 14k or 18k gold in white, yellow or pink gold. The silver ring has the same quality standards as the gold tanzanite gemstone ring ... more. If you are looking for a men's wedding ring with tanzanite and diamonds, the MAN61 will fit your requirements. A center cushion tanzanite gem is lined with a row of princess cut diamonds on either side, available in all sizes ... more. Let us now discuss the various issues related to tanzanite wedding rings for men. We will also talk about the reasons for this 'young' gemstone becoming so very popular with ladies and men. Many fashion experts describe tanzanite as an 'exotic' gem, why is that so. These answers and more in our information packed report right here. Exciting and Exotic: Gone are the days when serious jewelry lovers bought gems and jewelry just because, they were pretty or gorgeous. Buyers today look for excitement in the jewelry that they wear, gemstones and jewelry that has some historic elements, or rarity are given a serious look. You might have heard of the 2012 news report where, Kelly Clarkson the first American Idol and also a famous American singer paid 244,000 U.S$ at a Sotheby's auction for a gold turquoise ring that once belonged to the very famous British writer - Jane Austen. The ring if made today would cost no more than 1,500 - 2,500 U.S$ even if, you used the best turquoise in the world. The value of the jewel in this case is decided by the history of the ring and cannot be assessed merely by adding component costs. Any person with sufficient knowledge of gems would tell you that, taznanite is an exotic gem. 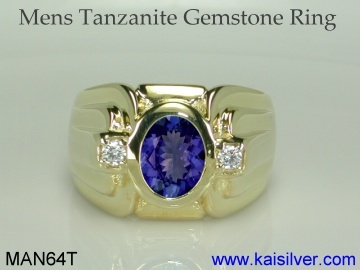 A mens tanzanite gemstone ring would have a gem that is mined in Tanzania, there really is no other nation that is known to have gem quality tanzanite resources. The precise location in Tanzania where Tanzanite is mined is limited to a few square kilometers. With such a limited source, tanzanite is rare - experts agree that it is rarer than a diamond. The excitement of wearing a mens wedding ring with tanzanite, would surely be enhanced by the fact that it is so rare. Fine gem quality tanzanite looks absolutely stunning, the glitter and color of a well cut stoned will impress even the most seasoned gem buyer. It would therefore be fair to say that, a tanzanite mens wedding ring would be both, exciting and exotic. Tanzanite Color: If we had to give a general describe for the color of tanzanite we would say that, it is generally violet with a splash of blue. There was a time when buyers, preferred tanzanite gems with a significant presence of blue. As knowledge of the gemstone spread, buyers realized that color saturation and clarity are more important than mere color hue. Here are some recommendations for color saturation (light to dark) for your tanzanite wedding ring for men. A substantial portion of the tanzanite that is mined and heated has a very light color, we generally classify this as 'lower grade'. If you had to get a mens wedding ring with a pale color tanzanite gem, the jewel would appear quite placid and drab. The metal color and construction of the ring, would be clearly visible right through the stone - something that would take away the focus form the gem. Very dark color tanzanite is classified as 'high grade' but, we would say that it can sometimes be so heavily color saturated that, the facets and light reflections can hardly be noticed from the top of the stone. We would recommend a medium color tanzanite gem for your wedding ring. This stone has the right color to, allow the glitter and flash of the gem to shine through the top. In terms of cost, dark colored tanzanite would be more expensive as compared to medium color tanzanite. And very light colored tanzanite is the least expensive. Gold Rings: It is generally expected that wedding and engagement rings be made in gold or even platinum. When it comes to mens jewelry and current conditions, generalizations have gone through changes. There is no doubt that many men are impressed by the calm and confident appeal of sterling silver. Economic conditions and gold prices have also resulted in a robust market for fine 925 silver jewelry. It would therefore be right to say that, you could choose a gold or 925 silver mens tanzanite wedding ring. For a gold ring, make the selection for white or yellow gold based on your preference. Rest assured that tanzanite looks stupendous in all metal colors. You would not have come across many mens rings in rose gold and neither have we but, one look at this awesome gem in a handsome rose gold mounting and you might just change your mind. As of now you could say that, yellow and white gold tanzanite rings remain the most popular option for mens wedding rings. 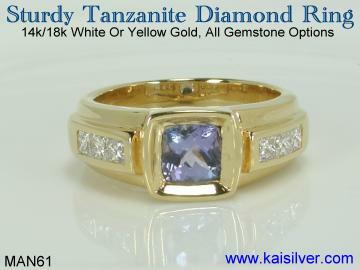 A choice of gold kartage would also need to be made and for this, 14k tanzanite mens rings is the most popular choice. Custom tanzanite rings are generally available in 14k or 18k gold - we recommend 14k gold because of the hardness of the metal. Silver Rings: Silver jewelry is very popular with men, price points and even the confident appeal of silver is what attracts men. It is therefore no surprise that mens silver wedding rings enjoy a high demand. You can surely hope to get a fine mens silver tanzanite wedding ring. In reality, it takes some searching to find a jeweler who is willing to craft a good quality silver jewel. The higher price point of gold keeps many reputed jewelers away from silver. While we cannot speak or criticize the jewelers community we would say on our part that, we have always welcomed both gold and silver jewelry orders. Our designing and production teams give equal importance and attention to gold and silver jewelry. There is no technical explanation why, you cannot get a silver tanzanite mens wedding ring with the same quality of gem, design and craftsmanship as a gold ring. On the issue of plating a mens tanzanite silver ring, we would suggest that you leave it unplated. While an unplated 925 silver mens tanzanite ring would tarnish, the plating on silver rings does not last for very long. As we will explain later in this report, cleaning a tarnished mens silver tanzanite wedding ring is not very difficult. At the same time, a plated silver ring would show a wear off (of the plating) in patches and cleaning such a ring would not be very easy. When you go for a mens silver tanzanite ring do not expect the ring to be 'cheap'. Remember that in the case of jewelry, cheap price translates into low quality too. Demand good quality design, craftsmanship and gemstone for your silver wedding ring. And keep in mind that, it is only the metal component that would be priced lower than gold, other cost factors would remain the same. Birthstone: The desire to include a birthstone in a mens wedding ring has gathered momentum in recent years. When it comes to choosing the gemstone for a mens birthstone wedding ring, there are two broad concepts. In the first concept, the man chooses his own birthstone. An interesting variation can also be adopted where, the couple exchange birthstones in their wedding rings. So would a mens tanzanite wedding ring represent a birthstone ring, here is the answer. Although many birthstone charts make no mention of tanzanite, the gemstone was officially designated as one of the birthstones for the month of December. This infact was the last official change made to the birthstone charts and happened in the year 2002. For those of you who want to know what the other December birthstones that could be chosen for a mens birthstone wedding ring are - blue zircon, blue turquoise and tanzanite form the December birthstone options as of today. Gem Size: Most of you would like a huge tanzanite rock for your mens gold or 925 silver wedding ring. This is especially true if you know just how valuable, exotic and rare the gemstone is. Unfortunately, some of these wishes can be very expensive and throw the ring well beyond your budget. Like most expensive gems, tanzanite gets to be very expensive as the gem size increase. At the same time, few men would be impressed with a small 1 carat tanzanite gem for their wedding ring. Keep in mind that we are talking about gem quality tanzanite, eye clean and with a medium color saturation. If you had to work an equation between the price of tanzanite and the quality of the stone, it is a 2 to 3 carat stone that would give you the best deal. We are not trying to say that a tanzanite mens wedding ring with this gem size would be 'cheap'. Good quality jewelry cannot be cheap and gems like tanzanite will always wear that 'upper price tag' label. But if are blessed with a significant budget for your mens wedding ring, go for a tremendous 4 to 6 carat gem by all means. Just keep in mind that, a larger gem has a larger exposed surface area. This would imply that you need to be a bit more careful, to keep the stone from being struck by physical impact. Diamonds: Does your mens tanzanite ring really need diamonds to 'enhance' it's appearance or beauty - the answer is NO. The next question is whether, tanzanite gemstone wedding rings worn by men generally have diamonds - the answer is YES. Given this scenario, it is worth spending some time discussing about tanzanite diamond rings. Diamonds in wedding and engagement rings have special significance, diamonds represent limitless time something that is never ending. And that is exactly how everyone wants a marriage relationship to be, never ending laced with love and compassion that lasts forever. Diamonds also add some glitter and give a lavish look to a jewel. While you could say that the rarity of diamonds also adds an interest angle, this might not be relevant when it comes to tanzanite rings. We explained above that, tanzanite is rarer than a diamond, it is therefore a symbol of everything that is rare, unique and valuable. If you do choose to get a diamond and tanzanite mens wedding ring, keep the diamonds at a modest size and number. Leave the interest on the tanzanite gemstone, it will give you a an impressive ring and not burden the price tag with diamond costs. Cleaning And Caring: Most jewelers would be so eager to sell you a mens wedding tanzanite ring that, they would not care to provide you with information that you will see in this paragraph. At Kaisilver, we encourage you to educate yourself about the gemstones and jewelry that you wish to purchase. We are willing to be that teaching medium even if, you do not plan to purchase anything from us. Tanzanite has a hardness of 6.5 - 7 on the Mohs scale, and this is harder than many gems that are far more popular than tanzanite. However it is necessary to keep your tanzanite mens ring away from places or situations, where it can be struck by physical impact. Cleaning the back yard, excercising or fixing a broken down car is ideally not done when wearing your tanzanite mens wedding ring. Physical impact can crack the gemstone and this, could cost you a lot of money to replace. Sudden temperature variations can damage many gems and tanzanite is one of them, this is however something that is fairly easy to handle. Ultrasonic jewelry cleaners should not be used to clean your mens tanzanite gemstone wedding ring. A bowl of clean water at room temperature, a very soft and clean toothbrush, a tiny amount very mild liquid soap and a piece of soft, clean and dry cloth is all that you should use to clean your mens tanzanite ring. If these simple items cannot clean your tanzanite ring, seek the help of a professional jeweler. In the case of a mens 925 silver tanzanite wedding ring, you could begin by using a reputed silver jewelry polishing lotion or fabric, to take away the tarnish. Follow the instructions that came with the polishing product and remember to, thoroughly rinse the ring after the polishing task is complete. This will take off any residue from the fabric or lotion that might remain stuck to the tanzanite gem or the silver mounting. Durability: This is one feature for mens tanzanite wedding rings that is dependent on many other features of the ring. Regarding the durability of the gemstone (tanzanite), much can be learnt from the previous paragraph related to, caring and cleaning tanzanite rings. Besides the gemstone itself, factors like design, metal weight, craftsmanship and even the type of setting used to mount the gemstone would influence durability of a mens tanzanite ring. At Kaisilver, we prefer to design and construct mens rings with metal bordering the entire gemstone, this is a safe and secure way to mount the gemstone. Prongs can save metal weight but, they can gradually open up as they get stuck in pockets and other places. This can loosen the gemstone something that, can require expensive replacement costs. Similarly, a design where the gem protrudes too far beyond the surface of a mens wedding tanzanite ring, is asking for trouble. A protruding gemstone is more likely to hit against hard surfaces and objects, this can damage the gemstone. Crafting a mens wedding ring with insufficient metal weight can cause the ring to dent and deform easily. So when you evaluate your options for a tanzanite wedding ring for men, give sufficient importance to features that can influence longterm durability. Buyers generally make decisions based on price points and external appearance alone, this could turn out to be wrong in the longterm. Authenticity: We have always maintained evaluating the jeweler as important as evaluating the jewel itself. When it comes to expensive gems like tanzanite, ruby and sapphire it might be a good idea to request for a gem authentication certificate. This certification should be done by an organization that has no interest in the business conducted by the jeweler. While GIA is one of the laboratories that issues gem certificates, countries like Thailand give more weight to certificates from Asian bodies like the AIGS or GIT. Since certification costs money, the jeweler might expect you to pay for the certificate - just go ahead and agree to that. We would say that you should always request for a gem authentication certificate when, the cost of a gold tanzanite ring is about 2,000 U.S$ or more or, when the price of a silver tanzanite ring is around 1,000 U.S$ or more. The certificate would normally state the type of gemstone, dimensions and weight and also a brief note on the treatment (if any) applied to the gemstone. In the case of tanzanite, the treatment would be marked as 'heated' in 99% of the cases. All tanzanite is heated to bring out that gorgeous color and clarity. We will confidently say, that you should refuse to buy your mens tanzanite wedding ring if, the treatment is mentioned as anything besides 'heated'. 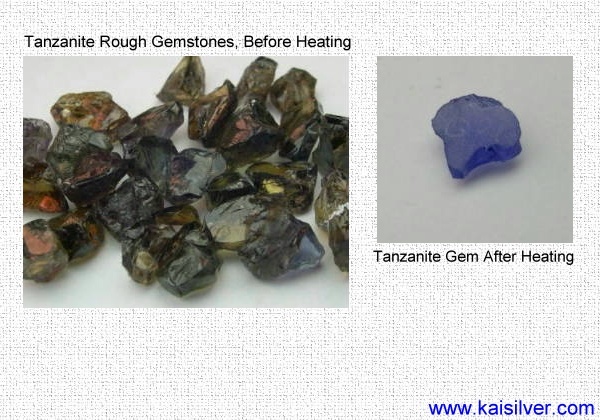 The tanzanite rough on the left has a dark brownish green color, this is how the stone is when mined. When we craft your tanzanite mens wedding ring, we procure rough tanzanite and do the heating ourselves. The piece on the right is shown after heating. By controlling the gem processing from rough, to heating to cutting and polishing we ensure that, no unacceptable form of treatment is applied to the stone. The authenticity of the gem is also assured as, it is only natural tanzanite that will turn to this gorgeous color when heated. The above report is very comprehensive and should equip you with all the information you need to choose a good mens tanzanite gemstone wedding ring. It is true that 70% of tanzanite ring buyers are not aware of most of the issues discussed above. Having said that, we strongly believe that a high priced jewel like a tanzanite wedding ring, should be evaluated and purchased only after a complete understanding of the gemstone and jewel. When it comes to choosing a jeweler to get your mens tanzanite ring from, we leave it to you. Kaisilver is surely not the only source to supply your ring. Take a good look around, evaluate options and jewelers and choose a source that you feel confident about. You can always contact our support team at sales@kaisilver.com if you have any doubts or requirements related to gems and jewelry. And if you have found the content on this website to be useful, please pass the link of this page to your friends, family and collegues. It is not easy to find gem and jewelry reports that aim to keep buyers informed, most information is geared to encourage sellers to sell more!